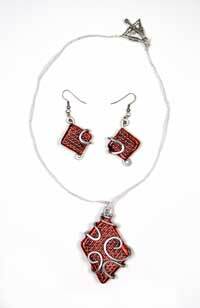 Play with the elements when you create this one-of-a-kind jewelry set from AMACO. Cut two 2” squares from the metal mesh. Cut two 1 5/8” pieces from the Friendly Plastic®. Cut four 5/16” pieces from the width of the strip of Friendly Plastic®. Heat a 1 5/8” square of Friendly Plastic® on aluminium foil until it is soft all over. Center a 2” square of mesh over the hot plastic. Lift the aluminium foil with the plastic away from the work surface and using your thumbs, pull down on the mesh while pushing up from underneath with your fingers. This will force the plastic through the holes in the mesh. Take care not to let your fingers touch the top of the plastic or this will flatten the bumpy texture created. While the plastic is still warm, stretch the mesh sideways to create an offset diamond. Cool and trim the mesh close to the plastic. Tip: Use a bowl of cold water to cool and harden the Friendly Plastic quickly. Repeat for the other side of the pendant, stretching in the opposite direction this time. Lightly heat the reverse of both pendant pieces until just glossy around the edges (2 or 3 seconds). Place the hammered wire into one side so the loop and about 3/16” of wire sticks out at the top, then push both pendant pieces back to back and hold in place until cool. Tip: Do not overheat or you will lose the textured effect on the front. Cut narrow strips long enough to go around the edges of the pendant about ¼” wide (you can do this in two shorter pieces if you prefer) and lay it color side down on the non stick surface. Heat with the heat gun until soft. Place the edge of the pendant on the center of a strip at one end, and roll the edge of the pendant along the strip to pick up the narrow plastic. Ease down both sides to form a finishing edge. Repeat with more strips until the entire pendant edge is covered. Tip: if the Friendly Plastic® strip cools before you have the chance to complete the process you can either dip the hardened area into hot water (140-160°F, 60-70°C), or use shorter strips of plastic. Allow to cool and harden. Take a length of soft metal rod and curl and bend it around the pendant with the round nosed pliers so that the design shows on both sides leaving 2 3/8” tail unbent. Open out the rod design so that the coils on both sides can be seen. Using a hammer, flatten the curves of the design except for the ones that will bend around from the front of the pendant to the back. This process will give the coils strength. Wrap the wire design over the pendant and curl the tail end around the stem of the hanging loop of pendant. Squeeze flat against the pendant. Attach the toggle clasps by tying the ribbon onto the clasp loops, knotting tight and close. Trim and add a dab of glue to secure the knot. These are made in exactly the same way as the pendant but in miniature. Cut four 1 ¼” squares of the mesh. Cut four 13/16” squares Friendly Plastic®. Attach the jump rings to the loop in the soft metal rod, and the hoop earrings. Seal everything using the clear acrylic sealant, either spray on or brush on. To test if the Friendly Plastic® is soft enough, bend it on the foil over your finger or a curved object. If it bends completely with no hard or partially softened areas, it is soft enough to work with. Caution: Do not over heat the plastic or you might hurt your fingers. If you don’t have Teflon® sheet or baking parchment, rub a little cooking oil evenly all over some aluminium foil. If anything sticks, place it into cold water. Keep fingers well moisturized with hand cream or oil. Open jump rings sideways to avoid over stressing the metal. Use just the width of a strip of Friendly Plastic® for the edge pieces as short strips are much easier to handle.